Beginning in 2017, JSEALS will be published by the University of Hawaii Press, and hosted at www.uhpress.hawaii.edu/title/jseals. JSEALS will continue to be a peer-reviewed, free, open-access journal. The blind review process and editorial board will not change. 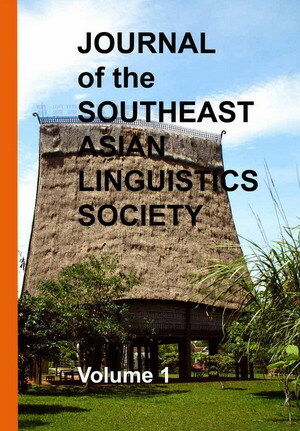 JSEALS (ISSN 1836-6821) is the peer-reviewed open-access electronic Journal of the Southeast Asian Linguistics Society, devoted to publishing research on the languages of mainland and insular Southeast Asia. Formally established by decision of the SEALS 17 meeting in September 2007, JSEALS supersedes the former SEALS Conference Proceedings published by Arizona State University. JSEALS is distributed as an open access journal by the University of Hawaii Press (www.uhpress.hawaii.edu/title/jseals), and the JSEALS website (jseals.org) and is indexed by Scopus. JSEALS is available from www.uhpress.hawaii.edu/title/jseals as an e-journal under the Creative Common 4.0 License. From 2012 on, individual articles may be downloaded from there as well. Papers from earlier SEALS conferences may be found at the The SEALS On-Line Archives. Introduction to BCP47 and ISO639-3 Language Tags (a SEALS 25 presentation by Martin Hosken and Campbell Prince) is available on YouTube. WHAT: Covering a region of extraordinary linguistic diversity, JSEALS features papers on the languages of Greater Southeast Asia, including Austroasiatic, Austronesian, Hmong-Mien, Tibeto-Burman and Tai-Kadai. JSEALS welcomes contributions written in English that explore linguistic issues (as opposed to topics focused on culture, anthropology, or pedagogy). Topics may include descriptive, theoretical, or historical linguistics, dialectology, sociolinguistics, anthropological linguistics, among other areas of linguistics of languages of Southeast Asia. JSEALS also admits data papers, reports, and notes, subject to an internal review process. WHEN, WHERE, AND HOW: Papers can be submitted electronically at any time. Please see the submission guidelines page. Also note the files and links on the left side of this page. If you have any queries about submitting your article, please contact the Editor-in-Chief at mark.alves AT montgomerycollege.edu. Although we normally expect that JSEALS articles will have been presented and discussed at the SEALS conference, submission is open to all, regardless of participation in SEALS meetings. Each original article undergoes double-blind review by at least two scholars, usually a member of the Advisory Board and one or more independent referees. We are grateful for their voluntary assistance in ensuring the quality of our publications. The Southeast Asian Linguistcs Society was founded by Martha Ratliff and Eric Schiller (who had the idea while car-pooling to work) in 1990. The first meeting took place in 1991 at Wayne State University in Detroit, Michigan, and was attended by (among others) Paul Benedict, William Gedney, Gerard Diffloth, James Matisoff, Laurent Sagart, Jerry Edmondson, and Graham Thurgood. Annual publication of the SEALS Conference proceedings was assumed by Arizona State University the next year. The SEALS conference regularly circumnavigates the globe, and has met in Southeast Asia, the United States, Europe and Australia. It is generally expected to meet in Asia at least every other year. See also Google map of past meeting sites. The JSEALS website is maintained by the Center for Research in Computational Linguistics. Please send requests for additions, corrections, or information to doug.cooper.thailand at gmail.com. Editorial queries should be directed to mark.alves at montgomerycollege.edu.